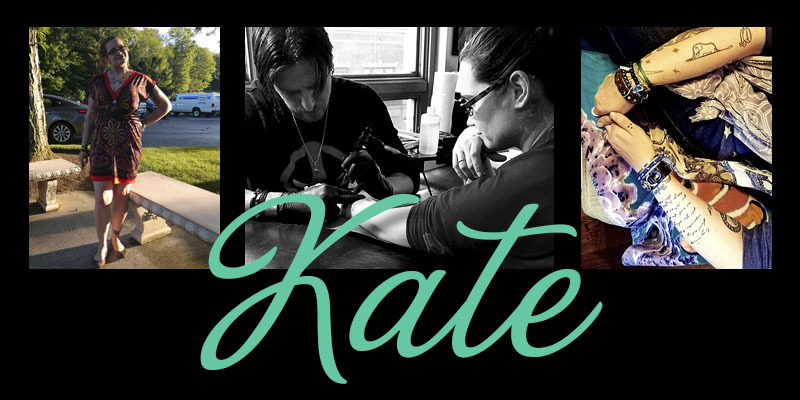 Featured Tattooed Mom: Kate M.
Let’s welcome Kate to the Tattooed Moms Club! She’s a fabulous lady that has worked on a couple of projects with me and I am so happy to have her as part of this one! And — TODAY IS HER BIRTHDAY!!!! Happy birthday, Kate!!! When my husband and I started dating the kids were just babies at 9, 7, 3, and almost 2. Now half have graduated high school and moved on to adult adventures and experiences and the two youngest boys are beginning to navigate the world of teenage life and high school with us. When my son was a baby, he thought I was his personal coloring book, but even at a young age I always tried to illustrate that my art was very personal to my journey. As they have watched my story grow, it has opened up some great dialogue between us. My kids friends have never really spared much thought for my tattoos. Some parents may have initially had some raised eyebrows at PTA meetings and other gatherings, but I have found that the taboo surrounding them is far less of a concern than it was even when I had my first one done. My parenting style could best be described as eclectic. Raising a Brady Bunch style blended family with 3 step children and my son, that can cause a myriad of issues to arise. Of course we did have our struggles, but it has truly been such a blessing for all of us. My husband and I are proof that opposites truly attract and we have found a really great parenting balance that, for us, does depend on the situation. With so many parents and step parents involved, we decided early on that as long as there was open communication, we were truly winning. That style has resulted in some pretty awesome young adults. Parenting has taught me patience. Not something that I have ever really had, and something I certainly didn’t inherit from my hot blooded Irish ancestors. I learned to appreciate different personalities (believe me, all 4 of these babies are now and always will be extremely different haha) and how best to deal with each little nuance as their ideas and independence grew. I don’t think I have ever faced any discrimination, no. As previously mentioned, I have definitely enjoyed some raised eyebrows at church or school functions, but I am also a professional woman and know when it is appropriate to cover up what possibly can be. As a certified paralegal I have lived in and out of courtrooms and law firms and I am currently working at a downtown Cleveland auto dealership. I think expressing yourself is an invaluable part of the journey we are on, but one must always be cognizant of the environment you are in and act accordingly. As for a favorite? That is like picking a favorite child or a favorite book…..each and every one contributes to the brilliance of the whole. I was 19 years old when I got my first tattoo…..I got it on the one year anniversary that my Dad died. It is a small lizard with the Ankh symbol woven through its body on my upper right arm. My ideal version of “me time” contains coffee, books, and nature. I am truly at my best when climbing a tree or Earthing. I read every day and probably get through 4 to 6 books a month. I’d say that 85% of my tattoos contain literary references. I pondered this question for awhile, and I would have to say that I would love to travel to the future to see my great-great grandchildren….I would be fascinated to see the beautiful things that my children and grandchildren accomplish with their lives journeys. Thanks so much for sharing a bit of your story with us, Kate!! We’re happy to have you as part of the Moms Club!! All featured moms are part of the “Moms Club” and you can find all of their posts in the Moms Club category. Get to know the moms in the club – they’re all amazing! Prev post Featured Tattooed Mom: Jessica K.